Europe's Herschel space telescope has produced a majestic new version of a classic astronomical target - the Eagle Nebula (also called M16). This dense region of gas and dust some 6,500 light-years from Earth hosts copious numbers of bright new stars. Radiation from these objects is sculpting the clouds of gas and dust, producing in places great columns and curtains of material. 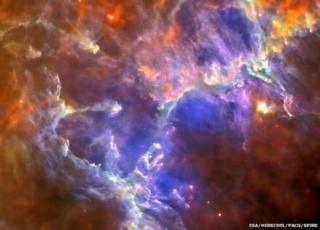 The picture is being featured on the BBC's Stargazing Live series. Brian Cox and Dara O'Briain are presenting the popular programmes this week from Jodrell Bank radio observatory in Cheshire. Look just below the centre of the image and you will see the columns that were famously dubbed the "Pillars of Creation" when they were pictured by the Hubble telescope in 1995. But Herschel and Hubble see distinctly different things in the nebula. Hubble is sensitive to optical light, the kind of light we detect with our eyes. This is easily blocked or scattered by the dust, and shows us merely the shape of the billowing clouds of material. Herschel, on the other hand, is sensitive to much longer wavelength radiation, in far-infrared. This enables it to detect the emission coming directly from the cold gas and dust that cloaks so much of the region. It is a powerful ability that enables Herschel to look inside the columns and curtains, at the places where dense gas is collapsing under its own weight to trigger the nuclear reactions that give rise to new stars. Herschel's is a false colour image in which the bluer material is relatively warm and the redder material is relatively cold. It is "relative" because these are temperatures below minus 200C. "The Eagle Nebula is one of the iconic regions of space popularised by Hubble but this has been our first chance to look at it with Herschel," explained Professor Glenn White from the Open University. "The dusty material you see in Herschel's image is the material that will form the next generation of stars. "Where you see little points, what you're looking at are the cocoons, the envelopes, inside which young stars are forming. Those stars will eventually blow away all the material that surrounds them and their optical light will become visible to us," he told BBC News. Also released by the European Space Agency (Esa) is an image at X-ray wavelengths of the central portion of the nebula. This picture, acquired by Esa's XMM-Newton space telescope, picks out the cluster of hot young stars that are doing so much to shape the whole region. The intense radiation from this cluster, known as NGC6611, is working to erode the famous pillars. Scientists are using the XMM data to try to hunt down the remains of a giant star thought to have exploded thousands of years ago. If we could magically and instantly transport ourselves to the Eagle Nebula, we might even see that the shockwave from this supernova has toppled the famous pillars completely. However, because of the great distance to the region and the time it takes even light to travel across the vast expanse of space, the pillars' fate is something we will not know until long into the future.